Michael Wallraff ist Archiktekt und Bühnenbildner und arbeitet seit 1997 selbständig in Wien, München und Los Angeles. Das Wiener Architekturbüro wurde 2004 gegründet und wird seit 2012 als ZT GmbH geführt. Es ist in unterschiedlichen Bereichen tätig: von Stadtplanungen über Adaptierungen, Umnutzungen, Zu- und Neubauten, Bühnenräumen, Ausstellungen und Möbeln bis hin zu Objekten der Alltagskultur. Michael Wallraff studied scenery design at the Academy of Fine Arts and architecture at the University of Applied Art in Vienna, as well as at the Southern California Institute of Architecture, Los Angeles. Since 1997, he has worked independently in Vienna, Munich and Los Angeles. 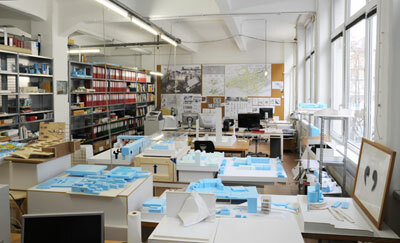 The Viennese architect’s office was established in 2004 and has been active in various fields: from city planning, adaptations, conversions, additions and new buildings, stage design, exhibitions and furniture up to objects of everyday culture. In addition to the Schütte-Lihotzky Fellowship (1998) and the Schindler Fellowship (1999), Michael Wallraff has received funding from the city of Vienna’s “departure” program (2009) and numerous competition prizes, including the 1st prize in the EU-wide two-stage open competition for the State Vocational School Center Graz-St. Peter (2007).